How to hide “internal” polygon boundaries? Our task is to draw a lake with a solid outer perimeter line and no lines between internal wetlands, shoals and shallows? 'Tis a relatively straightforward process with Arcinfo coverages and Regions, but alas, that is no longer a viable option for us, the datasets we use now are too large and the lack coverage editing ability in Arcmap crucial. Can cartographic representation solve our dilemma? Is it possible to create something like the below without resorting to creating (and managing) duplicating, or triplicating, geometries whose sole purpose is better looking maps? 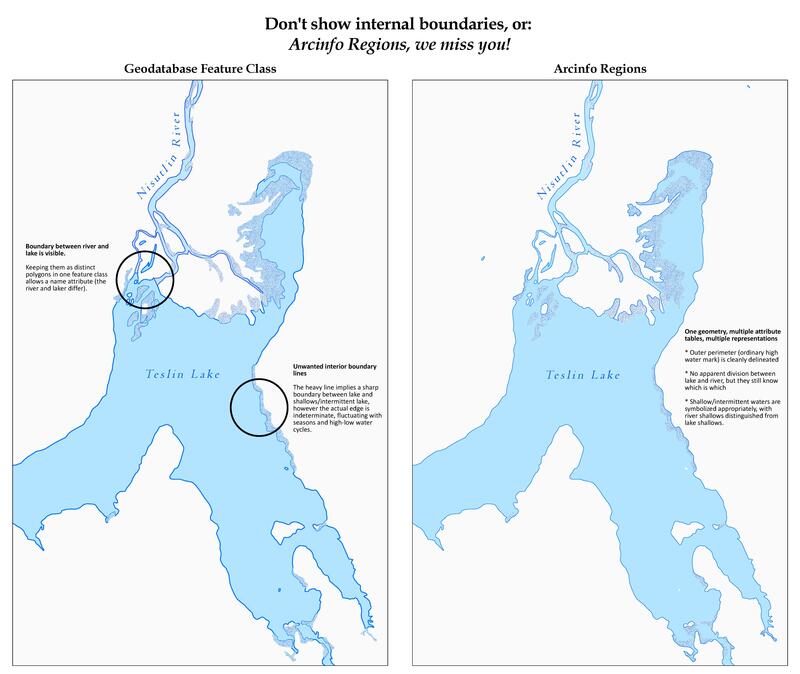 With a feature class: Boundary between river and lake is visible. Keeping them as distinct polygons in one feature class allows a name attribute (the river and laker differ). Elsewhere the heavy line implies a sharp boundary between lake and shallows/intermittent lake, however the actual edge is indeterminate, fluctuating with seasons and high-low water cycles. The line should be implied rather than drawn. With regions: One geometry, multiple attribute tables, multiple representations. Shallow/intermittent waters are symbolized appropriately, with river shallows distinguished from lake shallows. See here for a map package simulation of what we're trying to achieve and the source arcinfo region coverage from which it is built. I cross posted this question on Esri's Ask A Cartographer site. They pointed me to a mostly-suitable workaround: use Symbol Level drawing in general and Dissolving polygon boundaries using symbol level drawing in particular. Likely what Craig was pointing at earlier in his answer. I've seen the dialogs and help topics before but hadn't dug into them because the examples are about cased lines and I didn't understand how the same principles could be applied to polygons. With the v10 help they've greatly expanded the examples and procedures. Although written for a v10 audience it should help v9.x users as well as it hasn't changed that much. Sometimes editing a symbol causes it to jump to the top of stack (under "Advanced > Symbol Levels") and it's join/merge state change to unchecked. Sometimes the advanced settings won't "take", try changing the stack order and various applications of enable/disable join/merge. After enabling Symbol Levels Occasionally the "apply color ramp" step (#17) doesn't work at all. 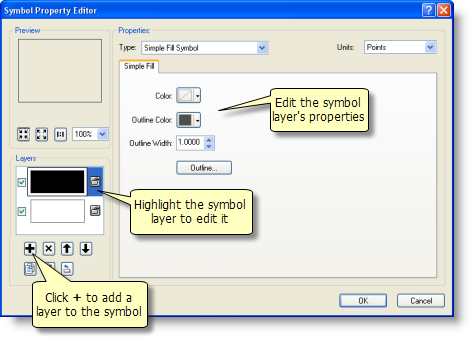 The symbols stick with what is defined in the upper most Edit Symbol dialog. An Arcmap reboot seems to cure it. Develop the habit of always doublechecking the stack order and the join merge properties. Just because you told it to do/not-do X doesn't mean it actually remembered. So in summary,for cartographic purposes Symbol Levels with join & merge properties is a workable if quirky analog for Arcinfo Regions. For analytical purposes like "query surface area of ordinary high water" you'll still need to do some geoprocessing and generate duplicate data. (UPDATE) It is possible after all to use picture symbols, symbol levels, and a single ToC layer. You set your tongue to the right, just so, stand on one leg (doesn't matter which), and face the moon. From here get a map package illustrating two working methods (Lake-cartography-symb-levels - update.mpk). Convert your region polygons to overlapping features. You can then symbolize them however you want based on attribute. 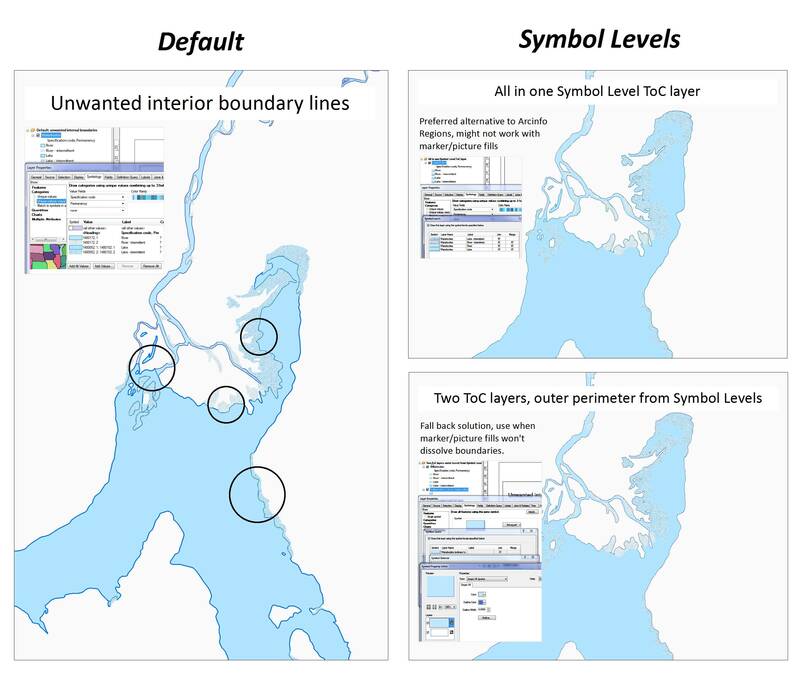 Drawing order can be controlled via symbol level drawing so that the wetlands always draw on top. Use topology rules to ensure the multiple polygons are kept in sync. Not the answer you're looking for? Browse other questions tagged arcgis-desktop cartography or ask your own question. Displaying road outlines but not segments i.e. no lines at intersections? What is the modern equivalent to ArcInfo CLEAN? 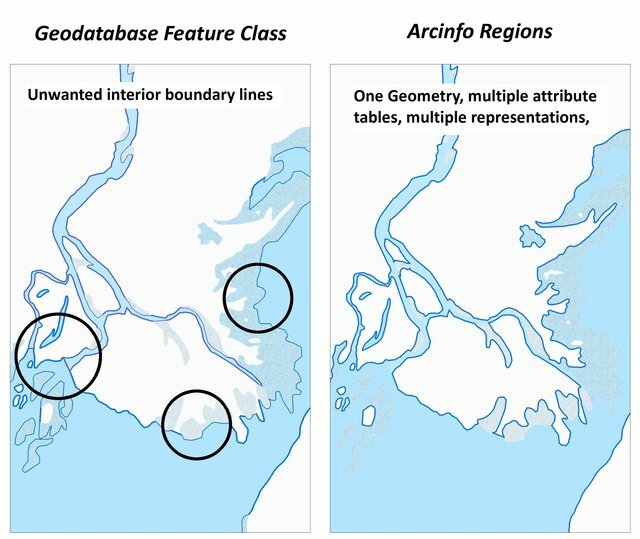 What is ArcGIS for Desktop (and Geodatabase) equivalent to Regions of ArcInfo Workstation Coverages? 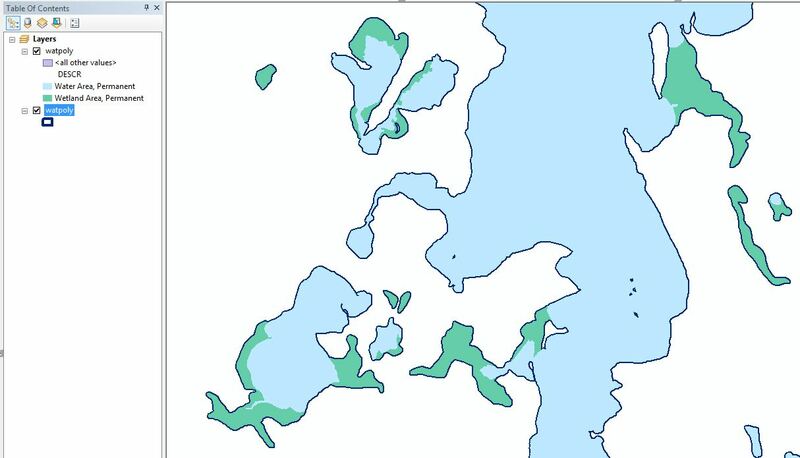 ArcGIS - Custom, rule-based borders for polygons? How to display nebulous boundaries between regions with indistinct edges? Symbolizing multiple polygons as one by dropping internal boundaries? Fading or Removing Boundaries in ArcMap? Creating lines from polygon layers boundaries?